BUFFALO, NY--(Marketwire - Jan 26, 2012) - Providing memorable experiences is nothing new for Delaware North Companies. In fact, this industry-leading hospitality management company has been doing just that for almost 100 years. Providing Stewardship and Hospitality in Special Places(SM) throughout the world, Delaware North works to ensure that guests can experience the rich, natural beauty of the its many owned and/or operated destination resorts, many of which bear historical, cultural, geographical or architectural significance. 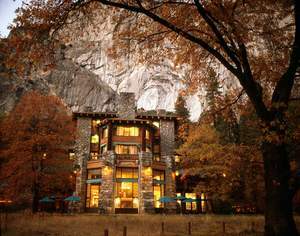 As well, the company operates in U.S. state and national parks, where the hospitality management services group often acts as park concessioner, program developer and hotelier. "By developing unique programs and services engrained in the very fabric of the places we serve, we are able to help guests discover how truly amazing these places are. From interpretive programs, onsite shopping and outdoor adventures, to local, organic, sustainable cuisine and one-of-a-kind lodging -- because we immerse ourselves in each property's history and personality, we're able to give guests authentic experiences they can't have anywhere else," said Kevin Kelly, president of Delaware North Companies Parks & Resorts. In addition to developing and administering a wide range of programs in the country's state and national parks, this hospitality management company also offers expertise in food service, lodging, travel hospitality, retail, sports facilities management, and gaming and racetrack operations. It is consistently ranked among the most admired hospitality management companies in the world -- and earns more than $2 billion in annual revenue. Delaware North Companies Parks & Resorts is an industry leader providing Stewardship and Hospitality in Special Places (SM), with hotel, retail, food service, recreation and transportation operations at historic and scenic properties in North America and Australia. The company operates Kennedy Space Center Visitor Complex and in Yellowstone, Grand Canyon, Sequoia and Yosemite national parks, including The Ahwahnee and other Yosemite lodges; Tenaya Lodge at Yosemite & the Cottages at Tenaya Lodge; Harrison Hot Springs Resort & Spa in British Columbia; Niagara Falls State Park; The Lodge at Geneva-on-the-Lake in Ohio; Gideon Putnam Resort in Saratoga; Holiday Inn West Yellowstone, Gray Wolf Inn & Suites and Yellowstone Park Hotel. The company also owns and operates five luxury resorts in Australia: Lizard Island Resort, Heron Island Resort, Wilson Island Resort, Kings Canyon Resort and El Questro Homestead and Wilderness Park. To learn more about Delaware North Companies' hospitality management expertise, visit www.experiencednc.com.